Christmas is almost here, but did you know that you could incorporate feng shui design into your home to make this the best holiday ever? Using feng shui at Christmas can help remove the usual holiday stress, making for a more peaceful time. 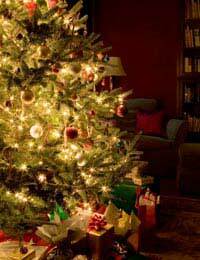 The best placement for your Christmas tree is in the centre or towards the left side of the main room. Invite family and friends over to help you decorate your Christmas tree. The togetherness of an event such as this will help produce positive energy for the holiday. Decorating the tree with angels and cherubs can bring tranquility and goodwill into the home, as they are both seen as lucky symbols. For prosperity, hang gold coins on the Christmas tree and keep a fresh bowl of fruit on the table. When decorating your tree, you should think about feng shui colours. Red is a favourite colour of the holiday, but do try to avoid overdoing the reds in your home. Red is a fire colour and can bring about unwanted stress and troubles if used in the wrong rooms. Green on the other hand is a wood element colour. It can not only be nourishing to your health, it can also help calm the home for the holiday. Blue is a water element colour and can also have a very thoughtful and spiritually calming influence. At the very least, make sure your reds, greens, and blues are balanced. Most people love having a Christmas tree, but do not forget that Christmas plants can be used in feng shui. Mistletoe is thought to calm people and give them a peaceful sense while holly is thought to bring goodwill to all. A poinsettia, because it is red, is thought to represent love and passion. Candles are a great feng shui idea that brings not only warmth into the home, but also positive chi energy and goodwill. Including wood in your wreath or fireplace is a great way to ensure harmonious family gatherings. Other items that help promote warmth and goodwill during the Christmas holiday is stars, lights, and reindeer. Most people love to have family and friends over for the Christmas holiday. To save your floors and carpet, guests often remove their shoes at the front door, but this is a common feng shui mistake. Your front door is where chi energy comes in, energy that is carried throughout the house. Having shoes there allows the odours to collect and travel through the home, which can cause sickness, so avoid having guests store their shoes there. In many places, it is cold during the Christmas holiday, so people tend to close up their homes. But, this does not allow fresh chi energy to flow into your house. So, next time you light the fireplace, open a window just a bit to allow the fresh air in – it can also bring good fortune into your home during the holiday. Your children are probably anxious for the big day to finally arrive and many have trouble going to sleep because they are so excited. But, do not allow the children to fall asleep on the floor. Sleeping on the floor does not allow chi energy to flow underneath them and can lead to illness. Many people practice feng shui principles year round, but because they change their home furnishings during the Christmas holiday, they often forget to apply the feng shui basics during this time of year.